Commentary: Did you ever pick up an item that just made you mad? While not a horrible abomination, the overpriced Emperor Palaptine in this 2-pack is a good example that, as of last year, Hasbro was pretty confident collectors would buy pretty much anything. Here's a Darth Vader figure offered no fewer than 5 separate times with a large head which, while cool, is also incredibly loud and drones on for a very long time. If you had this thing on your desk at work and someone set it off, you'd probably want to stab someone if anyone did it twice. The item plays the entire dialogue of the scene in which Vader and Palpatine chat in The Empire Strikes Back at deafening levels. It's clear as a bell and a unique technological achievement as far as toys go, but after you try it once you really have no reason to ever look at this again. If you're a fan and not a collector, it's a pretty nifty display piece and, arguably, not bad if it's the only Star Wars item you own. But for people who read columns like this one, it's one more damn thing to waste money on because it offers zero long-term play value like you might get out of, say, a Mon Mothma figure. Palpatine is a completely new sculpt and may be separated from the black circle base that Darth Vader kneels on falls off of. He's unpainted, which I think really works best for this one. The figure is significantly taller than any other holographic projection Hasbro has made in plastic, and the detail is really good too. I'm not saying this is necessarily worth the Andrew Jackson you're likely to spend on it, particularly because it comes with another Vader you don't need, but I'd be a bad fan if I told you it was without merit. This may be the best Palpatine sculpt we've ever seen out of Hasbro, and even though it's based on the DVD edition of the scene it's pretty swell. It's also worth noting that Hasbro made Palpatines based on this exact 60-second sequence a few times-- a 2004 Original Trilogy Collection release and the 2008 carded figure, based on the 1980 version of the character, come readily to mind. Still, they're all different enough that I'd probably still suggest giving them all at least one good hard look for candidates to add to your toy stash. Collector's Notes: This item did not sell out at the show and was in stock at HasbroToyShop.com for months after Celebration Japan and Comic-Con 2008. As such, don't pay a premium for it. Image: Adam Pawlus' TV tray. 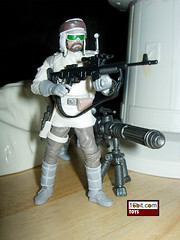 Also, that rifle is not included-- it was borrowed from the "Saga" Hoth Rebel because it looks cool. Commentary: It took a while, but Han Solo in Stormtrooper Disguise finally made it to the basic assortment. 32 years after appearing in the movie. But hey, here he is, and he's basically a revised version of the comic-colored figures released in 2007 (and returning to stores in 2009.) For the most part, this figure is a basic Stormtrooper except it now has a new belt (which works only slightly better as a holster than previous releases) and a removable thermal detonator. Han has 14 points of articulation and looks really fantastic. This is easily the best-ever release of the character in this costume, which, to date, has been released in an official capacity at least five times if you count significant deco variations. So yeah, go get one, you'll like it. Collector's Notes: This figure is the first-ever individually packaged Han Solo in Stormtrooper Disguise released to retail-- all previous versions were part of multi-packs or were mail-in offers. Also, the figure makes no mention of a "Stormtrooper disguise" andywhere on the front or the back of the packaging. Why, we don't know. Also interesting, Luke and Han Stormtrooper figures have distinctly different helmets and differently colored blasters. Commentary: There are few figures to have been produced as consistently lackluster as the Hoth Rebel Trooper, which Hasbro finally nailed on this release. The 1997 version was too distinct and looked like Han Solo with facial hair. (Although the deluxe radar cannon version was pretty swell.) The 2004 version was like the 1997 one, except with a more awkward pose and lacking the height he needed. 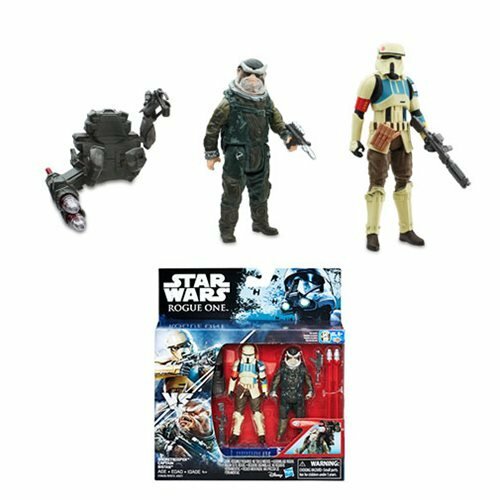 Numerous repaints and head swaps later, Hasbro has now given us the perfect Hoth Rebel Trooper body in 2009, and a head variant (with a different weapon, too) is scheduled to ship later this year. 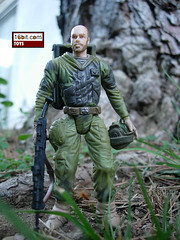 The release you can get now has a beard, and 14 points of articulation. Previously, the most articulated Hoth Rebel Trooper had 6 joints. 6. That's sad. This figure has all the articulation you've come to expect, plus they do a bang-up job of hiding the joints within the costume design. It's really a gorgeous release, with its pristine costume, top-notch sculpting, and working blaster holster. (Earlier releases had non-removable blasters in their holsters.) I fully expect to see Hasbro reuse this body for numerous other revisions in the coming years, so expect good things if you add this one to your collection. It actually made me grab a number of other Hoth toys to futz with, reminding me that there's still a lot of fun to be had with The Empire Strikes Back even though there are precious few new items to produce in an action figure line. Collector's Notes: This figure is a big ol' middle finger to variant hunters. Fans were already aware there would be bearded and beardless variants, but there are more variants within the bearded variety. 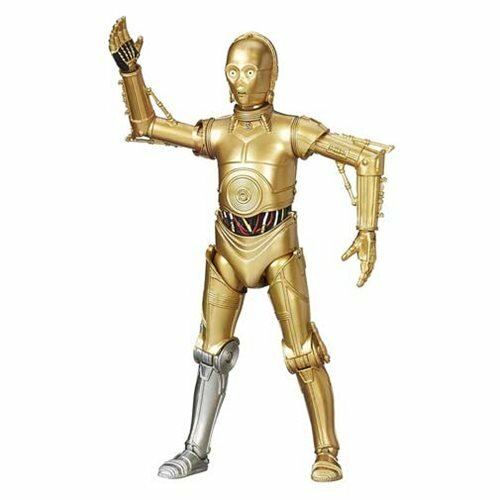 So far, the figure could come with either silver or champagne-colored U-3PO parts, and the figure has either a cloth "skirt" (shown) or no "skirt" (not shown because it looks kinda stupid). Action Feature: Squeeze legs together for lightsaber attack! Image: Adam Pawlus' BBQ. Looks kinda like Mustafar, I guess, sorta. Commentary: This Obi-Wan Kenobi was spared the incessant reissues of its companion Anakin figure, but it still had a few. This one isn't really any better or worse than the other repaints, but it does look fairly plain and as such is worth looking at-- or rather, it was, in 2005. 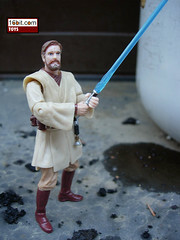 Later that year a super-articulated mold was produced and nearly every new Obi-Wan figure has been based on that mold. So this one's already substandard for most collectors, as it doesn't have super-articulation or the greatest likeness on the planet. He has but 10 points of articulation, and is somewhat awkward. His slice-and-dice mechanism really doesn't get in the way too much, but he does have difficulty sitting and as such may not be your top choice for ROTS Kenobi action. The sculpt is really nothing special now that we're a few years on, but it isn't awful. 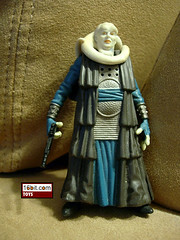 The costume looks about right, and his head does look a little tall and thin-- but it's unmistakably the Jedi general. Since there are better versions I can't really suggest you drop the cash on this one, but hey, there are worse versions you can buy. Collector's Notes: This mold has frequently been repainted and reused. 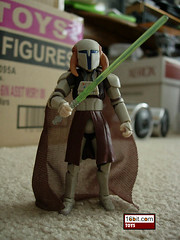 A "lava" version was sold in 2005, this figure was packaged with a then-exclusive Toys "R" Us blue Jedi Starfighter, and he was redecorated for the first batch of Target exclusive Order 66 sets in 2007. This mold gets around despite being reasonably iffy by today's standards. 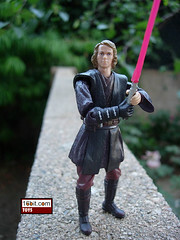 Commentary: As I've mentioned before, figures of Anakin Skywalker from the first prequel pretty much up and vanished in 2000, with one exception in a Jedi High Council pack around 2004. This particular version-- and most from 1999-- were basically all the same figure with slightly different limbs or accessories. A single sculpt was modified and made into a basic figure, a pilot version, a pilot version with an LCD game, a pack-in, and so on and so forth. 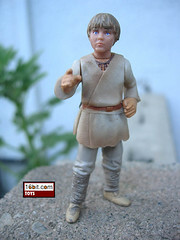 They basically resembled the character, and had more than a passing resemblance to actor Jake Lloyd, although the toy seems to be slightly darker skinned and had a slightly less round face. So, how cool is this figure? It really isn't. Nearly 10 years after its release, I can safely say that this one has basically remained in a box for most of the past decade. While packaged with unique Sebulba and Jar Jar Binks figures, neither are ultimately compelling enough in the modern collecting world. This Anakin's most notable feature is a pointed finger that makes it look like he's lecturing Jar Jar. That's the high point here. He has six points of articulation and no accessories to speak of. If you have one Anakin Skywalker from The Phantom Menace, you really do almost have them all. This one's for collectors only, especially collectors of packaged stuff. The boxed set looks quite nice. 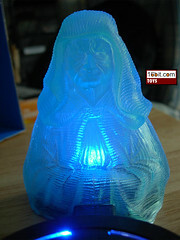 Collector's Notes: This mold has never been reissued, but it's so close to other figures you might not realize this. As mentioned above, what makes this release distinctive is that pointing finger arm. I guess you can do "pull my finger" dioramas all day long if you get this one. Hooray for the elevation of the level of discourse in toy collecting! And fart jokes! Commentary: Since 2005 we've had some version of Anakin Skywalker from the final prequel in circulation. Maybe they'd label him "Darth Vader," but it's the same basic figure with new bells and whistles. This particular version was made for the kid-friendly year of 2005, in which you could buy figures pretty much everywhere and they were pretty cheap too. This particular figure isn't super-articulated-- that sort of thing wasn't really common at the time-- but he did have what were essentially ball-jointed elbows, a removable right hand which you could swap out, jointed hips, a jointed neck, and ball-jointed shoulders. So he was pretty good, even though a really awesome version would follow him down the road. This figure looks basically good. He's a little thinner and tanner in the face than other versions, but you basically get who he is when you look at him. The deco isn't anything special, and newer versions of the figure have been entirely resculpted to include ball-jointed hips, which basically means the main reason to get this figure is his unique accessory-- a red lightsaber, which we're told is from a deleted scene. Apparently, at one point, Anakin was supposed to construct a Sith lightsaber. This was removed from the final film at some point, but the concept made it into the toy line. The figure itself is a fun toy, but it has difficulty sitting and really, the main reason to get it is the wacky slice-and-dice action. Collector's Notes: This mold has frequently been repainted and reused. In addition to this basic carded release, the figure has appeared in Battle Packs, been repackaged with new accessories, and most recently was redecorated in 2008 as a "comic book version" for Wal-Mart's exclusive comic pack assortment. 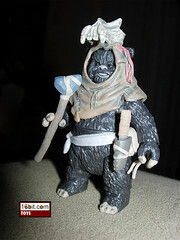 Commentary: While this is the first-ever toy to carry the Leektar name, this lesser-known Ewok hero looks pretty cool. Actually, he looks a lot like Romba, because the two share a body. Hasbro modified the 2007 Romba figure by adding a new head, a new belt, and a new headdress to create this new warrior. Given the quality of the Romba body and the lack of variety in Ewok body types, this short, fuzzy, pudgy little guy looks pretty awesome. While the knife sheath on his belt is a little more pronounced on the toy, he really does match reference photography nicely. His fur color, unique grin, and tubby build are all replicated with all the care you would expect from a glorified head-swap. But in all seriousness, it's good. The figure is jointed at the shoulders, wrists, ankles, hips, waist, and neck. While not super articulated, there really isn't much room for more movement on these little guys without making them look worse, so this is what I'd consider to be about as good as he could get. Since he comes with Nippet, it's a set well worth owning, but the price really isn't all that great when you consider the Graak and Romba 2-pack cost $1 less, were both new sculpts, and were two larger Ewoks. Nippet is essentially a static PVC figure. Still, this is one of my favorite releases of 2008 simply because it's not every day Hasbro cranks out a character from Return of the Jedi that I haven't had in some plastic form since 1989 or earlier. Kudos, Hasbro, and keep bringing these puffballs out. My wallet is yours for the violating. Collector's Notes: Still available, the carded figure has a "First Day of Issue" variation you can buy if you want. This set is slowly fading from stores after a huge launch and, frankly, overproduction in 2008. Commentary: Since the early 2000s, a couple of my "oh man I hope they make that guy" figures have been A'Sharad Hett and his pop, who we reviewed earlier this year. This Tusken Raider Jedi holds a dear place in fans' hearts due to his appearing in numerous stories in a variety of roles, from being an object of Anakin's rage to eventually becoming a Sith Lord. And possibly dying, who knows, I'm not sure. Anyway, the cool thing about this guy is that he's totally awesome and can lead around your clans of Tuskens against the puny farmer rednecks of Tatooine. How cool is that? The figure was, at the time, a completely original sculpt. (Well, one of his lightsabers was recycled, but aside from that, all new.) His articulation was exceptional for comic packs of his day, but it wasn't the super-articulated craziness you might want. 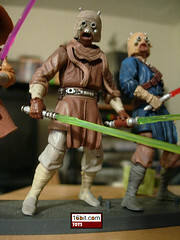 Hasbro gave this young Jedi ball-jointed knees, and swivels at the neck, waist, wrists, elbows, and hips. His mask is removable, and was painted quite nicely-- Sharad Hett's, on the other hand, kinda sucked. He even had a scarf of sorts, which is pretty slick in making the figure look just a little bit better than it might have otherwise. This is a fine example of Hasbro doing good work on a character that wasn't widely known by non-comic fans, so it's great to see the inclusion of his tats and unique lightsaber hilt. The sculptors did their homework, and this is the greatest version of the character in plastic so far. It is also the only version of the character in plastic. Collector's Notes: The figure shipped in 2007, but didn't stick around too long. You won't find him at retail today unless you luck into a crappy Wal-Mart or, possibly, Kmart. A'sharad's alter ego Darth Krayt will see production as a toy later this year, and there are no known plans for the Jedi's other outfits which were far more recognizable than this one. Personally, I'm glad they went with this one so I can put him with my banthas and Tuskens. Image: Adam's back yard. 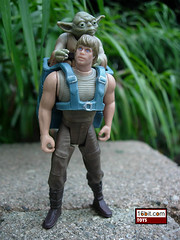 Yoda, backpack sold separately. Commentary: This figure is two firsts in the modern line. Not only was it the first-ever Dagobah-specific Luke Skywalker action figure, but it was also one of the first figures Hasbro (then using the Kenner banner) overproduced and, eventually, started to be taken back. That isn't to say it's a bad figure, it's just that when faced with the third modern Luke figure, fans decided they'd rather buy Yoda or another character. This figure isn't half bad, actually, but the 2004 version is way, way better. So even though I haven't said anything about it yet, I can tell you right now you don't need the 1996 version. Still, it was a pretty decent figure-- it could stand on its own, Yoda could ride around on his back, and the figure was about as good as the other toys available at the time. Which is to say, you got the token six points of articulation, adequate deco, and a head sculpt that really didn't stand the test of time. Luke's a solid toy, his arms won't pop out, he can sit, and he looks perfectly adequate. It's just that, as you can see in the picture, this is a horribly dated toy. The detail on the boots is admirable, the sculpting on the shirt is pretty good, but sadly, a lot of those early figures didn't do much to make you want them once a better version came out. And that 2004 release was extremely cool. Collector's Notes: The figure shipped in early 1996 and stuck around a while-- it was never repackaged on a green cardback like many other figures from the first years of the line. It's quite common, I wouldn't suggest paying more than $2 for it if you decide you need one. Image: Adam's floor. Cape not included. Commentary: After a couple of stumbles, Hasbro really made up for its Saesee Tiin figures. The Episode I version was basically a pepper shaker, and the sequel's figure was little more than an awkward statue-- but a nice one. then we got crazy good figures for the 2003 Clone Wars release, a spectacular basic figure for Revenge of the Sith, and as of last year, this rockin' Clone Wars space armor version based on the cartoon series from 2005. This was on a short list of figures I assumed Hasbro would never bother to do-- and once again, I love being wrong. The stock figure is one step away from perfection. On the cartoon, the Jedi Master had a cape flowing in the non-wind of space, which looked really cool and was one of the more memorable aspects of the costume. Sadly, I had to add my own-- the one in the picture is from a spare Mandalore figure. Saesee himself, though, is fantastic. His removable helmet fits perfectly, and his green lightsaber looks awesome. The figure's armor isn't simply reused bits of an existing figure, nor is it colored like any other clone. The off-white armor has a dark brown body suit, and little bits of Jedi robes pop out from the gaps. The figure has all the articulation you could hope for, with ball-jointed knees, neck, ankles, and shoulders plus normal joints at the wrists, waist, and hips. If you don't buy this figure, you probably hate Expanded Universe or cartoon stuff, which means you are probably the kind of person who hates kittens and candy and reruns of Unhappily Ever After. Collector's Notes: The figure (so far) has only shipped in Wave 2 of Legacy and has not made a return appearance. So you might want to go get this one while you can, it's one of my favorites of 2008 and I think you'll like it too. 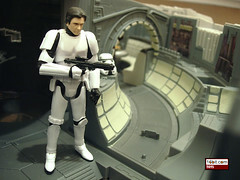 Image: Adam's Kashyyyk insert from a Galactic Heroes set. Commentary: Sometimes shooting schedules and the editing rooms can be a problem. Figures are developed months in advance of the final cut of a film at times, and this C-3PO comes from a scene that simply could not have taken place in the final cut as the fussy droid was fully assembled before Anakin showed up on Tatooine. Still, that doesn't mean you don't have a decent figure here. Hasbro modified the basic sculpt of its 1999 Episode I C-3PO to add some bits of plating and a lot of holes. These holes hold the new plating comfortably, making this one of few "quick-change"-style figures to come out of Kenner/Hasbro over the years that not only works, but works well. It's a pity that it didn't end up being from an actual scene of the film. Our not-yet-golden hero has the basic six points of articulation and, for the most part, looks pretty great. The deco is good on the paneling, but under these faux armor chunks he's pretty plain-- the amazing wire paint job we saw on the original prequel release simply is not present. He still has a fair amount of personality and this is a good figure for anyone who considers themselves a droid fan, or someone who likes droid factory type setups. After all, he's essentially an unfinished droid and a pile of parts-- this is a nice release for kids or the droid collector. Yes, even if you have 12 other C-3POs-- none of them can do what this figure can do. Collector's Notes: A one-timer, this figure will likely not see release again due to it being an unintentional deleted scene figure. Commentary: If you were to ask me to write you up a short list of Dark Horse characters which I figured WOULD be made, but NOT using a new mold, this Amanin would be at the top of the list. The 2001 Amanaman mold was pretty swell, and really, they could just take the existing figure and give him new gear and call it a day. Hasbro went the extra mile and totally retooled this figure to be sturdier than its ancestor, and significantly larger. Significantly. There's supposed to be 2-3 meters tall, and obviously, the one in ROTJ was some sort of dwarf. The thing about this figure that I don't necessarily get is what it means as the species is concerned-- comic book artists take licenses with characters and design all the time, and generally Hasbro tries to make a "realistic" interpretation of their designs. In this case, it seems very much like Hasbro was gunning for a literal recreation of the comic version of the alien, with longer neck, meaner face, bigger forehead, and an overall more muscular build. Despite carrying around skulls, the 2001 Amanaman is Urkel to the 2009 Amanin figure. This new version has a bendable tail (a first), ball-jointed shoulders, swivel wrists, swivel hips, and that's about it-- thus making him the most articulated member of his species in toy form. His coloring is a little less garish than the original, although I still do prefer the original figure's overall look. But not his limp staff accessory, which will droop with gravity and heat. Collector's Notes: A new release (and totally worth the price of admission), this nifty figure is something you totally gotta get. If not for him, get it for Janek Sunber. The combined pairing is quite a steal, and who can't use more preposterously-sized vegetable-like alien warriors? The comic series he came from is also pretty swell, it's "To The Last Man" and was originally printed in Star Wars: Empire #16, #17, and #18. It's rare you get to see a story in which the Empire are not portrayed as 100% evil big bad mofos... that's what the Amanin were for. Commentary: What could make a Super Battle Droid better? How about blasting off a chunk of it which you, the hapless fan, have to rebuild? That's what this version is all about-- it's basically the same as the 2002 figure, but now it needs to be "molded" with its accessory. In other words, this is a figure designed squarely for the kids-- adult collectors probably won't dig the Play-Doh smell, but it is a great way to actually impale a droid on a lightsaber. Actually, this is probably the only way you can ever live out this sort of play mechanic, which is pretty cool now that I think about it. The deco is pretty iffy, but the articulation is great-- you get ankle joints, which was still quite unusual in 2003, along with knees, shoulders, hips, and elbows. Commentary: This R2-D2 is one of Hasbro's finest hours in terms of appealing to a wide audience. While its articulation was lacking, it had "Try Me!" packaging-- the first-ever such packaging for a basic Star Wars carded figure-- which invited kids and parents to push the button and hear their favorite little robot beep and light up. This delightful feature is one Hasbro was very proud of, according to a conversation I had with the brand manager folk way back at Celebration II. They have good reason to be proud, it's not every day you can do something to make a 3 3/4-inch action figure stand out as a star in the retail space. The figure itself is, by collector's standards, nothing special. The dome is not articulated, the third leg doesn't retract, really the main reason to buy it is the two Kouhuns Assassin Centipedes. The beeping is cool, but the 2004 Dagobah and 2005 Revenge of the Sith releases (the latter of which has been in Saga Legends ever since) have better sound effects and a better grade of materials used in their production. 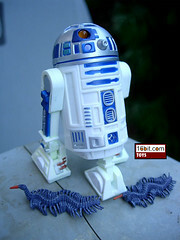 This figure is a neat evolutionary step in the tale that is the R2-D2 action figure, so it didn't age particularly well. I won't say "avoid" but prepare to be underwhelmed. Collector's Notes: The body of this figure was reused to create every electronic beeping R2-D2 that would follow, which actually made for quite a few figures. The 2002 release, pictured here, had a weird white plastic issue which caused a greenish yellow film to cover the figure. This can also be found on various Amidala and Clone Trooper figures in 2002 and 2003, and can be cleaned off with a damp cloth. Usually, anyway. The discoloration is extremely common if you kept the figure in a cool, dark place or in a dusty warehouse. Image: Adam's shelves or something. Commentary: As far as movie-based toys go, Hasbro lives Revenge of the Sith. 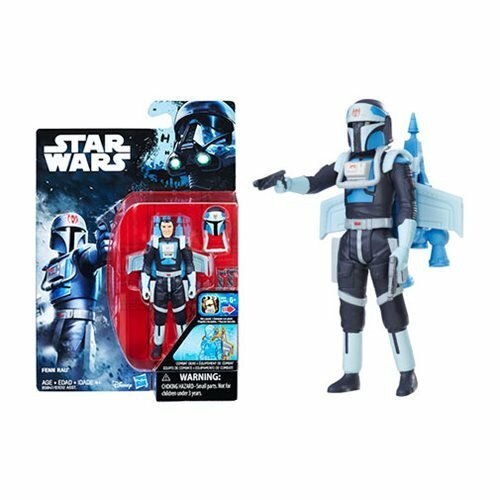 The most recent prequel gets a wave or two of toys a year as of late, and FX-6 is evidence, along with 2-1B, that they're running out of good options. The 2005 Revenge line was a massive undertaking packed with clones, Jedi, Sith, and aliens galore and now, a few years later, we're starting to see more refinements of existing figures alongisde the occasional new one like this droid. It's great that they made him, but sadly he doesn't seem to be as much of a quality figure as the 2001 FX-7 droid, nor is it particularly exciting. While important for any "birth of Darth Vader" diorama, it's basically a salt shaker with arms. After you plug in the multiple tool arms, really all there is for this guy to do is to stand around and look neat. 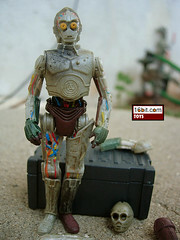 There's a fair amount of color on this droid, and it does look fairly creepy for a medical robot. His moving arms add some variety to the toy, but after having it for a while I can't think that it would have been more at home in a Battle Pack or some other format. It seems to be selling well, but I honestly can't find anything particularly thrilling about this, the first and only plastic incarnation of the character. Collector's Notes: Still available (if you're lucky), this guy has been around since last Fall as part of the final wave of 2008 basic figures. It wasn't a particularly interesting grouping of toys. Commentary: Take a new head, a helmet from 2002, and a body from 1998, and now you've got a pretty nifty Rebel Commando figure. While articulation is sorely lacking, the 1998 figure had a great pose and a lot of detail to which Hasbro added a lot of paint to make it look pretty slick. For example, this bald trooper now has gloves in a brown color plus a little grit. If you like variety in your Endor dioramas, this is one you should pick up because (if my count is right) this makes like six or seven unique Endor Rebel figures. Hasbro hasn't yet made a perfect super-articulated version, but obviously you can do better than a mere six joints. Still, it's neat-- but for 2006 it was a little disappointing. Hasbro's decision to give it a new head elevates it from a dull rehash to a fairly decent update, but, again, this is a figure that's mostly going to please army builders. 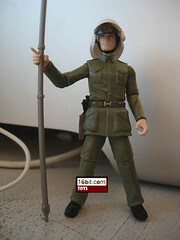 Those seeking the perfect Endor Rebel should keep looking, I'll let you know when Hasbro finally makes it. Collector's Notes: The tin is a nice set-- you get the 2004 Vintage Darth Vader, a repaint of the 1998 Princes Leia in Endor Dress (with the cloth bits), and a Scout Trooper with flip-up helmet. Totally worth getting. 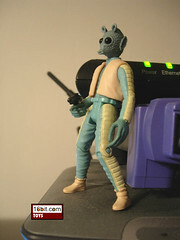 Commentary: The 1979 and 1996 Greedo figures were a little funky, but still basically good. This 1999 release had a resized head and a wonderful sculpt which, at the time, was an incredibly well-detailed release. Standards have changed and Hasbro opted out of the pastel vest, but this figure was designed well for your cardboard Cantina dioramas. This was the first-ever Greedo with jointed knees, a properly sized head, and removable vest. There's even a blaster mark under the garment. If you want a figure to sit across from Han Solo in a bar setting, this is probably it. Or it would have been, had Hasbro not repainted and reissued it in 2002 and 2004. Or made a "Vintage" version in 2006. It hasn't aged too well just because there are better alternatives, but if this was the last Greedo Hasbro ever made I think it'd have been an acceptable one. It only has eight points of articulation, but again, do you really need a lot more? I don't think so. It's nice, but not necessary for the character, who holds up Han Solo at gunpoint, sits down, and gets shot. 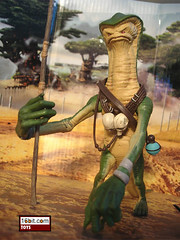 ...actually, a Greedo who can flop down dead on the booth would be pretty cool. Hasbro, get on it. Collector's Notes: A great seller at first, fans moved on quickly because Hasbro introduced very few classic figures in 1999 and 2000-- and this was one of them. 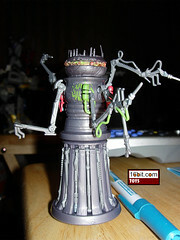 It has since been repainted and improved, and a totally new sculpt has also been made. As such, you don't need this one, but it's pretty swell. Commentary: There are precious few figures from the original Star Wars which fans are still looking forward to as toys, and the Rebel Honor Guard was one of those cool additions in 2007. This is one of those cases of getting it right the first time. Not only is it super-articulated, but the sculpt is really good. When I got this figure, it was shortly before the new G.I. Joe line started, and the detail on the uniform made me think of what a good military figure should look like. The greenish color is great, the pockets are cool, and yes, it even has a holster. 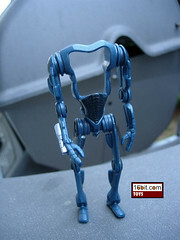 A number of these elements were incorporated into the new Joes, and given that this figure's whole purpose is to stand around and to hold on to a stick, in all seriousness, Hasbro did too much work. I know fans cry "we want 91 points of articulation" but in the movies, these guys stood at the end of a hall of people, said nothing, and did nothing. This is the kind of quality and attention to detail that fans tend to like, it's just odd that it was done to this figure and not, say, Scorch (the Clone Trooper). If you like this figure's look, I'm fairly sure you're going to want a few of them. It's a pity they're out of circulation, but well, at least you know it's worth tracking down now right? Collector's Notes: This figure came and went in short order, most fans didn't seem to go bonkers over it but it's worth getting. Commentary: "Let the Wookiee win" is a phrase oft-quoted in fan circles lo these many years, and this Chewbacca figure really captured the moment nicely. His Dejarik table plugs right in to the 1995 version of the Millennium Falcon, and it has all these nifty monster pieces on it. The figure can sit right at the table, and was designed specifically for this purpose. If he's standing-- like in the picture-- he looks silly. A number of my friends pointed out that he looks like he's ready to give or receive some form of table dance, but the figure is essentially true to the scene from the original film. He's meant to sit down, hands behind his head, savoring the compliment/threat implied by the fact he might tear R2-D2 to pieces. As far as personality goes, this figure's pose captures it quite well. His face is a little too goofy given how dark his eyes looked in that sequence, but hey, nobody's perfect. As Chewbaccas that can sit go, this is arguably the best of them in recent memory because his pouch or waist fur doesn't get in the way of things. 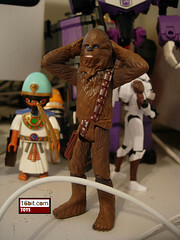 Our favorite Wookiee has eight points of articulation, with his knees being the notable addition. The main reason to pick this figure up is for the pose or the table, although his smaller size may not be ideal for any displays you make with more recent action figures. Still, the sculpt is good, and I more or less dig this release despite it being a little out of date. Grab it if you can! Collector's Notes: This figure was around for a while in 2000 and was pretty popular. Until early 2001, when Hasbro made the first "tall" Chewbacca with all the height you have since come to expect out of Hasbro. Dejarik Chewie was the last "short" version of the Wookiee hero. Commentary: Ol' worm head has been a staple in the figure lines since 1983, when Kenner made its very first Bib Fortuna. It was largely inaccurate, and this first modern version corrected the look of the robes, gave him a better head sculpt, and handed him a blaster that you never saw him use instead of the ornate staff you never saw him use from the 1980s version. Bib has also been given a new clamshell robe which snaps over his body, preventing any movement underneath the rubbery garment. The figure's look is great, and had Hasbro not gone back and redesigned this guy, it'd hold up fairly well. Our hero does have articulated hips and a waist, but they're not going to do you much good. His head movement is restricted by his unique head tails, but his arms can basically move freely. It's a pretty stiff figure, but it won't fall apart under moderate play. I like it, but not enough to suggest you make this your preferred version. 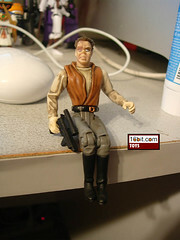 Collector's Notes: A 2004 Original Trilogy Collection repaint has minor changes to the clothing around the chest area. The 1997 release looks slightly better. The figure was completely redesigned and resculpted in 2006, which is the version I'd advise you to buy. The version featured here was sold through the end of 1997, but hung around in some markets. Commentary: If you released a recognizable character from an iconic scene in cinema history as a toy, and it sucked, what would you do? If you're Hasbro, you would take Dr. Evazan and give him new legs and a fresh coat of paint. The 2004 release of one of very few Cantina characters to speak was a great improvement over his predecessor, but he's still not pudgy, or balding, or really ugly enough. If anything this looks like a younger version of the character, but with one major change: his new legs allow him to sit down just fine. This is handy since he comes with a bunch of stools. Hasbro's revised paint job brings out the figure's detail in ways the 1997 release didn't, so if you had to pick one over the other, get this one. He has eight points of articulation, while this is not fantastic it's certainly good enough for now. I am of course assuming Hasbro will some day make a 100%-new version of the character, but the rumblings out of Hasbro as of late make me think this might be a ways off. Collector's Notes: Today is FOTD's 3rd birthday! This figure lingered briefly, but you can probably chalk that up to Kmart not being the retail monster it once was. This is arguably the better of the two (so far) Dr. Evazan figures.